Pornchai (Joe) Semjang, HS2JFW, K2JFW was elected President of RAST at its annual general meeting on Sunday, March 4, to serve the society for the next two years and he will succeed outgoing president Chaiyong Wongwuticomjon, HS1QVD who will continue to help RAST in an advisory position. Following the election of the president, a new committee was voted in by almost 40 members who were present at the AGM. Nine officers of RAST were elected, being Swen Roeder, HS0ZFZ, Chalermpol (Champ) Muangamphun, E21EIC/KY1A, Pittaya Pinchutharat, HS1FRU, Anan Phantongkam, HS1GAB, Pornpimon Suksansomphop, HS0VDX, Narissara (John) Showanasai, HS1CHB/N9WMS, Isared (Yod) Chindanonda, HS0XNO, Watcharapong (Tof) Chujinda, HS0NNU and Dr. Jakkree Hantongkom, HS1FVL/KJ6TJO. The newly-elected President and elected officers then agreed to appoint a further five committee members. Representatives of the Rotarians of Amateur Radio from Japan led by Tim Masuda, JH1NVZ also presented an ICOM HF transceiver to RAST and the society will be assisting the establishment of a special event station in conjunction with a World Conference of Rotarians scheduled to be held in Bangkok in May 2012. Details about the preparations for the May 19 Intermediate Class examination -- the first to be conducted in nine years -- that is being organised by RAST for the National Broadcasting and Telecommunications Commission (NBTC) were announced at the February meeting by RAST President Chaiyong Wongwuticomjon, HS1QVD. This followed a RAST committee meeting to discuss the details in late January and the appointment of a subcommittee to oversee the exam which will be conducted at Bangkok University. The committee has drawn up details regarding registration for the exam, how to pay the fee and the schedule for the examination and Morse code tests. Here is a summary of the relevant details. A Thai version along with a registration form may be found (after February 20) at the Thai-language RAST website. Candidates may register to sit the exam from February 20 to April 30 at www.rast.or.th and after transferring the exam fees totalling 421 baht to RAST by making an ATM transfer they will receive a registration form by visiting the office of 100 Watts Magazine (in Pattanakarn Soi 44, Suan Luang), or from Bangkok University in Klong Toey or the Rangsit campus, from the Club Station shop, from Khun Champ (8/1 Suksawat Soi 25 in Rat Burana) or, by making an extra 50 baht payment, they may receive this document by post (EMS). Completed application forms and all supporting documentation should be sent by EMS post to RAST at P.O. Box 2008, Bangkok 10501 before April 30, 2012 and candidates may check their status online at the RAST Thai-language website. The exam itself will be conducted at Bangkok University, either at the Kluay Nam Thai campus (in Klong Toey, Bangkok) or at the campus near Rangsit (in Pathum Thani) on May 19, 2012 beginning with registration between 8-8.45 a.m. followed by an opening ceremony conducted by RAST and the NBTC between 9 a.m. and 9.20 a.m. This is to be followed by the Morse code receive test between 9.30 and 10 a.m. while the main examination (theory) will be conducted from 10.15 a.m. to 12.15 p.m. During the afternoon, between 1.30 and 4.30 p.m. those who passed the Morse Code receive test in the morning will be required to demonstrate their ability to send Morse Code. The results of the exam will be posted on June 10 at the RAST Thai-language website, the NBTC website and the 100 Watts website and on August 8, 2012 RAST will organise an event to present diplomas to those who passed the exam. RAST is now busy making preparations for the exam, preparing 500 examination questions for the NBTC, notifying all amateur radio associations and clubs of the schedule and registration details by email and by other means and it will conduct a training session shortly before the date of the exam. RAST President Chaiyong said that the society would also open a new bank account to handle transactions related to the exam and details will be posted on the web. The RAST committee also agreed to a suggestion from Kanchit, HS1JC to conduct training in basic operating practices for an intermediate class ham radio station for those interested who pass the exam in May and the topics will include international band plans, the QSL bureau, well-known contests, HF propagation, basic antennas for HF such as dipoles, Yagis and antennas for limited space, digital modes, QRP operation, HF transceiver specifications and RF safety. Charly, HS0ZCW, suggested that RAST take advantage of the potentially large increase in the number of amateur radio operators with HF capabilities in order to gain new members and should offer incentives for them to join the society. 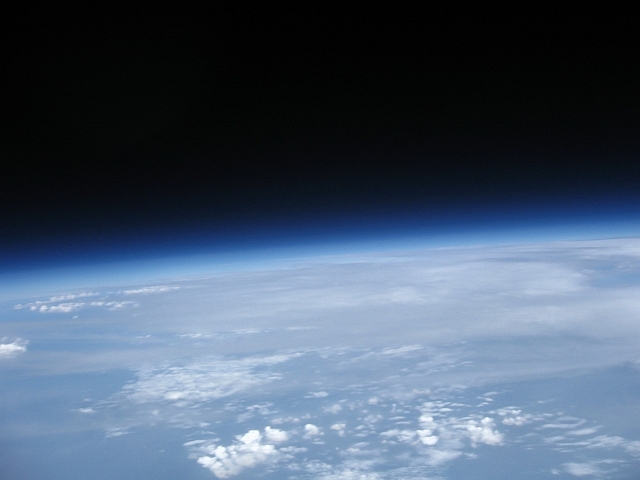 The highlight of the February meeting was a presentation about MSBAT-1, a multipurpose stratosphere balloon for amateur radio that helps Thai radio amateurs push the limits and to prototype and test equipment that might be used in a satellite. 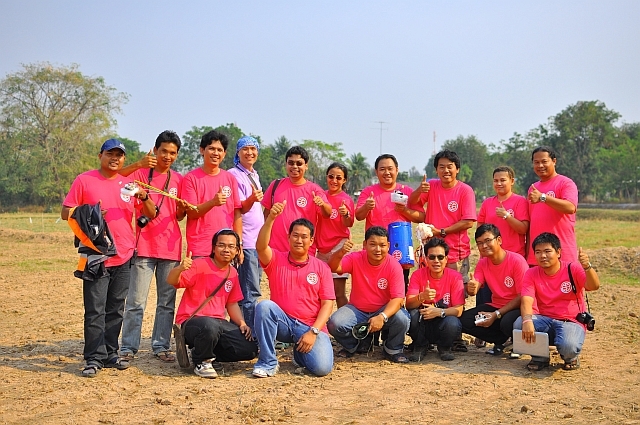 On January 29, 2012 a group of enthusiasts, among them several RAST members including Joe, HS2JFW, Champ, E21EIC and Thida, HS1ASC went to Ang Thong where they launched a helium balloon that soared to a height of 29.4 km with around one kilogram of equipment including a camera that took many of the pictures shown here at right and at lower right. 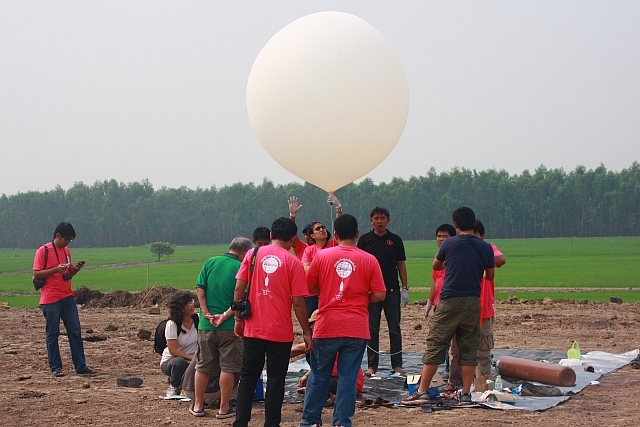 Making the presentation were Joe and Thida, along with Champ who was manning the computer with the images as they described the launch, how they were tracking the balloon for some three hours, and then racing to the location where it returned to earth in Suphan Buri, some 81 kilometres away to the northwest -- although this had been very close to the estimated landing area. Fortunately, the package touched down next to a dirt road and was easy to retrieve, although the team had a boat at hand and were also prepared to trek through thick jungle, if necessary. Equipped with APRS tracking equipment and a camera that recorded an image every 30 seconds, the equipment was in an insulated foam pack as the temperature on the upper fringe of the atmosphere falls to minus 30 degrees Celsius. 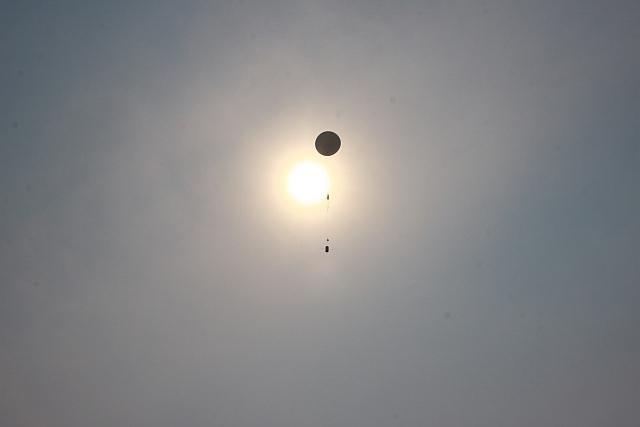 The expedition was judged to be a success and plans are to stage a follow-on balloon launch on March 11, 2011. 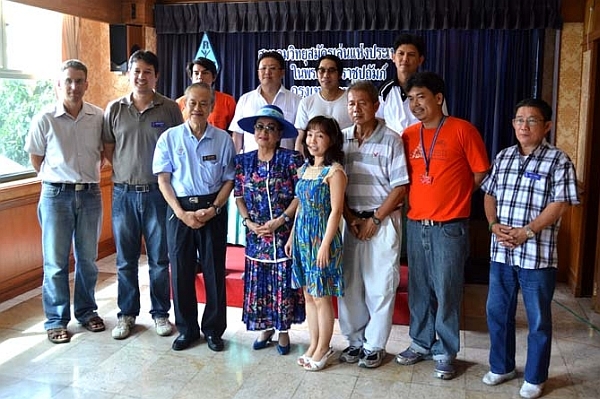 Sponsors of the event included RAST, 100 Watts Magazine, the NBTC, Tamsat, the Radio Amateur Association of Krabi, APRS East and the ARRL VEC Thai team. Earlier on Sunday, February 5, Toshio, JA2DOU, a life member of RAST for many years, led a small group of Japanese radio amateurs to meet with Chaiyong and other committee members before the main meeting to discuss the possibility of Japan and Thailand entering into a bilateral reciprocal agreement. 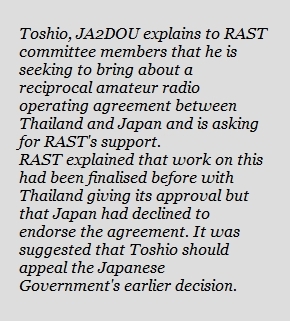 Chaiyong and Tony, HS0ZDX said RAST would be happy to endorse any activity in this regard while Champ, E21EIC recalled that between 1999 and 2004 a group of Japanese radio amateurs led by JA0QZ and JA6GIJ had worked to try to achieve this, with Thailand's Ministry of Foreign Affairs authorising such an agreement. However, the Japanese authorities had reportedly ultimately rejected it, saying that it had been "inappropriate". At the meeting it was agreed that the best approach might be for Toshio to work with the JARL towards lodging an appeal for reconsideration of this decision by the Japanese government and RAST said it would be ready to support any such request with a letter of endorsement if necessary. Japan now has nine reciprocal agreements -- with the United States, Canada, Germany, France, Australia, Korea, Finland, Ireland and Peru -- while both countries experienced national disasters last year with the tsunami in Japan and flooding in Thailand where amateur radio had played a role in disaster relief. There are also several Thai radio amateurs living and working in Japan and many Japanese radio amateurs resident in Thailand, it was pointed out. The February meeting was well-attended and there was a lively discussion about the future of the club station at the Asian Institute of Technology (AIT) that followed the report by HS0AC Station Manager Finn, OZ1HET. As can be seen from photographs on this website, the flood damage across the AIT campus had been horrific although cleaning up is now under way, with Finn reporting that he visited the club station on February 2 after receiving a call from AIT staff asking if he could open the door for them. He noted that when he arrived at the AIT compound he could see that staff had cleaned all the exteriors of the houses, including our club station, and had moved away almost everything that we had left outside, which had mostly been furniture damaged beyond repair. Finn agreed that the contents of the club station could be moved outside and stored under a plastic cover so cleaning and repairs to the interior could proceed and that after this had been completed, the AIT staff would move everything back inside the building. A discussion ensued at the meeting regarding the options for RAST's HS0AC club station, with concern expressed about remaining on the ground level of the AIT campus, which could be prone to flooding again, and concerns were even expressed about the future of the institute itself. Options, including having the club station on the premises of the NBTC compound in Phaholyothin Soi 8, or on the campus of a different university or by building a second floor at the AIT site, if feasible were discussed, with no conclusions being reached. There was even a proposal by Charly, HS0ZCW to opt for a mobile club station in a large vehicle such as a mobile home or RV. Finn, meanwhile, took the opportunity to announce his resignation as club station manager at the end of his term on the present RAST committee which expires at the beginning of March when an AGM will elect a new president and committee for the next two years. 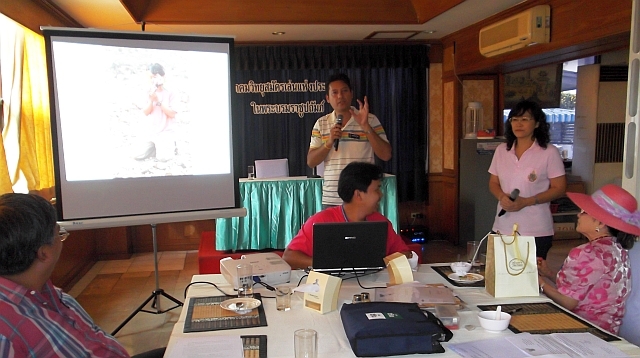 In a related issue, the RAST committee discussed the need to get type approval for each and every make and model of amateur radio transceiver imported, for which the fee is now around 27,000 baht. For mobile phones and VHF transceivers that are sold in high volume here, this is a small one-time fee that the manufacturers are prepared to absorb, but when it is applied to a single amateur radio transceiver that is for non-commercial use the fee can be as much as the value of the equipment. RAST intends to discuss the possibility that the NBTC might waive such a fee in certain circumstances. 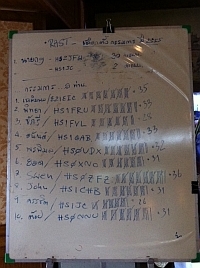 This issue has been highlighted by the need for RAST to replace many of its transceivers at its HS0AC club station that were destroyed by flood water where many radio amateurs overseas have offered to donate equipment to the society for its club station that is not on Thailand's type-approved list. There is also the issue that almost all new amateur radio transceivers are capable of transmitting on the six-metre band (50-54MHz) which is not yet allocated for use here and RAST Vice President Kanchit, HS1JC suggested that RAST seek permission to operate on this band on a temporary basis for test purposes. Narissara also pointed out that the NBTC has recently issued import licences for HF equipment that operates on this band where the operator declares he will not operate on this band without prior authorisation, which is an encouraging sign. 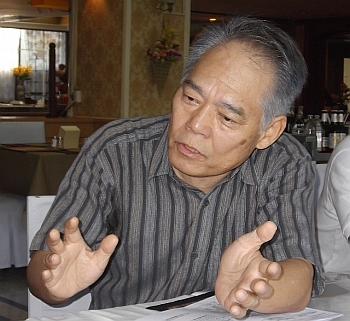 RAST President Chaiyong said he would keep members informed about any developments in this regard. 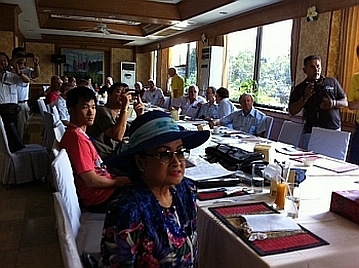 There is a big increase in the HF and VHF spectrum to be allocated to amateur radio in Thailand in a draft that has been prepared by the NBTC, with a public hearing planned for February 10, 2012. If approved and enacted as it stands today, in summary it will authorise the following additional amateur radio and amateur radio satellite spectrum: 1.825-2.000 KHz, 3.540-3.600 KHz, 50-54 MHz, 146-147 MHz, 430 - 435 MHz, 438-440 MHz, 122.25-123 GHz and 134-141 GHz. This will be in addition to existing allocations according to the draft, Joe, HS2JFW reports. 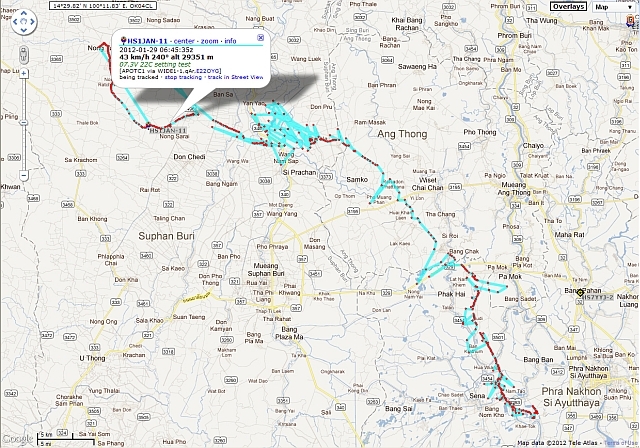 Please find a summary of the authorised amateur radio spectrum in Thailand as of January 24, 2012. We look forward to updating this web page with the additional spectrum after it has been assigned. 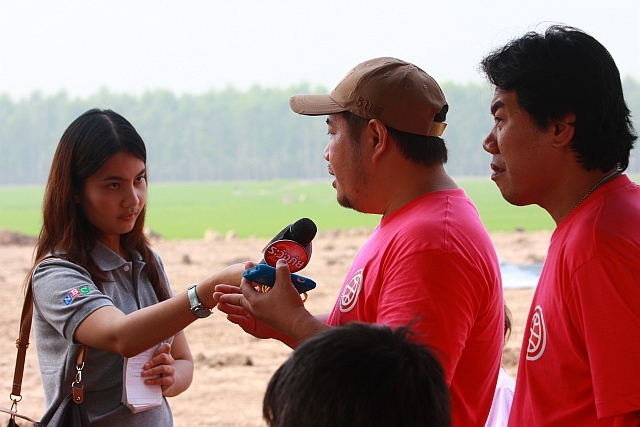 Last month, a group of RAST committee members, Champ, E21EIC, Kanchit, HS1JC, Narissara, HS1CHB, Thida, HS1ASC along with Joe, HS2JFW lodged a formal complaint to the National Broadcasting and Telecommunications Commission to protest interference to the portion of two metres that is reserved for satellite communications. Champ continues to organise US FCC Volunteer Examiner Co-ordinator (VEC) exams for anyone seeking to obtain a US General, Advanced or Extra class licence which is one way that a Thai novice radio amateur may gain HF privileges here after receiving a US licence. The NBTC recognises the status of such a licence and has now granted several Thais an intermediate class licence based on this. The next scheduled exams are on February 25, in Chiang Mai, March 17 in Bangkok and on April 7 in Chumphon province. For more details and the possibility to register to sit one of these exams please check out Champ's website . Finn, OZ1HET also announced further progress in the Thai-Danish reciprocal agreement, saying that the Danish authorities had informed him on January 19 that they had received information that the agreement only needed a government signature in Thailand, which should take one to two months. 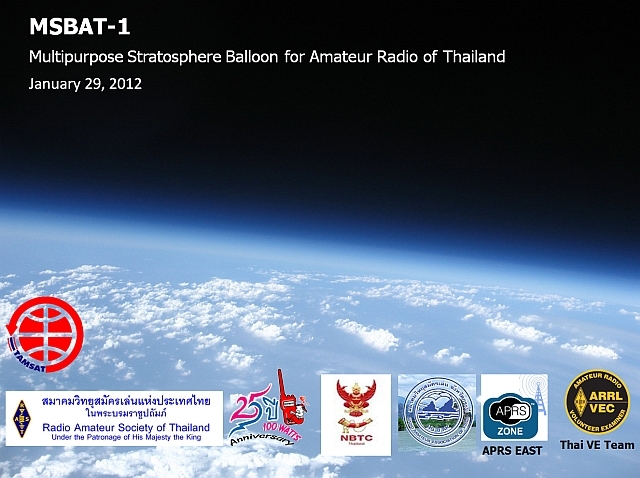 Photos from the MSBAT-1 launch in Ang Thong courtesy of Champ, E21RIC.